Listen to the full discussion about genetics, weaving, software development, democracy, risk management, and a process that encourages the inclusion of multiple points of views when making a decision. With Denise Caruso, Jesse Simons, Travis Meinolf and other guests. DSCF2402.JPG, originally uploaded by ericlawrence. 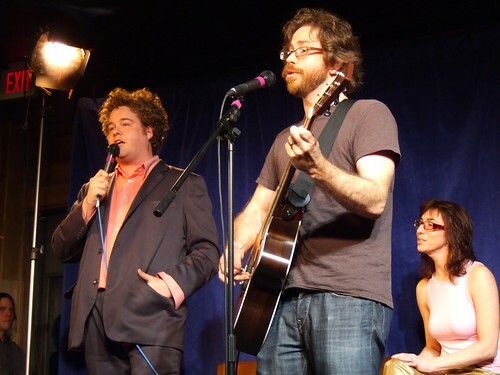 That’s Sean Nelson of Harvey Danger, Jonathan Coulton and me enjoying their take on Billy Joel’s Don’t Ask Me Why. We had a standing room only crowd and sitting room stage where we ran out of room for chairs for all the great guests. SXSW prompts indulgence. The audio and video will be up soon. More pix (thanks Eric Lawrence).